Charles Nicolle was the sole recipient of the 1928 Nobel Prize in Physiology or Medicine for his discoveries about typhus, including how to stop it spreading. Nicolle made a further crucial contribution to infectious disease research when he discovered inapparent infections: these are cases where an individual is infected with a disease and spreads it without falling ill.
Charles Jules Henry Nicolle was born into a middle-class family in the city of Rouen, France on September 21, 1866. Charles’s mother was Marie Louise Aline Louvrier. His father was Eugène Edouard Nicolle, a university professor and hospital doctor. The couple had three sons, all of whom enjoyed outstanding careers: Charles’s older brother Maurice became a renowned microbiologist, while his younger brother Marcel became an art critic, museum curator, and recipient of the French Legion of Honor. Charles attended Pierre Corneille High School in Rouen. He loved studying literature and history, but his father encouraged him and his brothers to spend more time on science: he made the subject interesting for them, passing on his own enthusiasm. The result was that two of the three brothers became eminent scientists. Charles did not enjoy living in Rouen – he considered it, and most of its citizens, dull and boring. He spent his spare time reading – especially books that allowed his mind to wander far from his hometown: he loved travel books, history books, fairy stories, and Jules Vernes’ fantasy stories. Despite his disdain for Rouen, at age 18, Charles Nicolle began studying medicine at its university’s medical school. In 1887, age 21, Nicolle moved to Paris to serve as an intern in its hospitals. In January 1889, he joined the Pasteur Institute to carry out microbiology research. The institute was still very new – it had been inaugurated just two months previously. Nicolle studied chancroid, a sexually transmitted disease, which became the subject of his doctoral thesis in 1893. In the spring of 1894, age 27, Nicolle returned to Rouen as a hospital doctor and substitute professor at the medical school. In 1896, he was promoted to director of the bacteriological laboratory. During this time he experienced a hearing loss, which meant he could no longer use a stethoscope to assess patients’ health. In January 1903, age 37, Nicolle left France and arrived in Tunisia, which was then a French colony. He had been appointed director of the Pasteur Institute in the city of Tunis. It was here he would make his great discoveries about epidemic typhus. Nicolle had very little experience of this disease in France. Soon he was observing multiple cases in Tunisia, where the disease regularly broke out in rural areas in winter then spread to the city, particularly into prisons and flophouses. He made understanding typhus his top priority. The word typhus applies to several different diseases. Epidemic typhus is often simply called typhus. Historically the disease claimed millions of human lives. Outbreaks were strongly associated with impoverished people living in overcrowded, unhygienic conditions, warzones, prison camps, and refugee camps. Typhus causes fever in its victims along with a rash and severe muscle pain. It also affects the brain, resulting in confusion, delirium, and stupor. A notorious outbreak took place during the Russian Civil War, when in 1920 three million people died of typhus. Typhus was the main natural killer in Nazi concentration camps during World War 2. A Russian poster from 1919 warns of the dangers of lice, infections, and death. Image courtesy Wellcome Collection. Epidemic typhus has been given a variety of names through history including jail fever, hospital fever, ship fever, famine fever, trench fever, and camp fever. Untreated it is fatal in 10%-60% of patients. Epidemics no longer occur, but the disease is endemic in cold regions of Central and South America, Africa, and Asia. The case fatality rate in modern times is 1%-20%. Six months after he arrived in Tunis, Nicolle arranged to visit a prison to study typhus in the inmates. A day before the visit was scheduled he began coughing blood. Two his colleagues went in his place. Nicolle recovered from whatever had made him cough blood. The two who visited the prison were less fortunate – both died of typhus. Nicolle abandoned his plans to visit the prison, instead visiting Tunis’s native hospital. After studying typhus patterns there, he noticed something important. Typhus patients being treated in the hospital’s ward did not spread typhus: doctors and nurses in the wards were safe from it. However, staff who met the patients before they were admitted were not safe from infection. Administrative staff who met patients before they were admitted could become infected. Significantly, laundry staff could also catch typhus even though they never met the patients. Staff who took patients’ everyday clothing from them before the patients were washed were also at risk. Nicolle realized the disease was not spread by people, but was spread by something on their clothes. Patients were always stripped of their clothes and washed with soap and water before they were admitted to a ward and these patients were no longer infectious. The disease seemed to be carried on people’s clothes, skin, and hair. Nicolle concluded that the disease was spread by lice. The louse – a blood-sucking parasite. The image above was the first ever microscopic view of a louse. It was drawn by Robert Hooke and included in his revolutionary book Micrographia, published in 1667. Typhus is spread by the human body louse, Pediculus humanus corporis. Typhus is more likely to strike large numbers of people during the cold season when people live in more crowded, unhygienic conditions, allowing lice to spread from person to person more rapidly. Transferred blood from a human suffering from typhus to a chimpanzee. The chimpanzee got a fever, indicating it was infected. He transferred blood from the chimpanzee to a macaque (a monkey). The macaque got a fever, indicating it was infected. He took lice grown on the macaque and placed them on other macaques, which became infected. Lice had spread the disease. Later Nicolle discovered that guinea pigs could also be infected, but the disease was not fatal for them. This allowed him to maintain a constant supply of the disease in guinea pigs for further research. Lice could not be kept for this purpose, because the disease actually kills them too. Nicolle discovered that blood serum from patients who had survived and were recovering from typhus could be used as a temporary vaccine against typhus. Doctors and nurses who were vaccinated in this way were immune from the disease, but not for long. Between 1910 and 1914, Nicolle and his colleagues in Tunis proved that typhus is carried in louse excrement. Anyone carrying infected lice who scratches themselves picks up louse excrement on their fingers and fingernails. The disease enters their bodies if they rub their eyes, which are particularly susceptible to the infectious agent, or scratch their skin. Nicolle did not discover the infectious agent that causes typhus. In 1916, Henrique da Rocha Lima established that the disease is caused by the bacterium Rickettsia prowazekii. 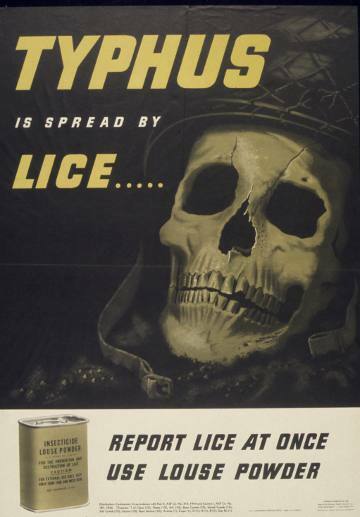 An American poster from World War 2 warns about lice and typhus. In 1958, France issued a stamp to commemorate Charles Niccole. In October 1895, age 29, Nicolle married 21-year-old Alice Louise Avice. They had a daughter and a son: Marcelle and Pierre. Pierre became a biologist. After leaving France in 1903, Nicolle worked for the rest of his life as director of the Pasteur Institute in the city of Tunis. Unfortunately, the deafness that started when he was a young man grew progressively worse, making it increasingly difficult for Nicolle to enjoy any social life. He never lost his love of history and literature. He wrote a number of novels including The Two Thieves, The Pleasures of Boredom, and Marmouse and his Guests. Charles Nicolle died aged 69 on February 28, 1936. He was buried in a tomb at the Pasteur Institute in Tunis. "Charles Nicolle." Famous Scientists. famousscientists.org. 30 Sep. 2018. Web. How Charles Nicolle of the Pasteur Institute Discovered That Epidemic Typhus Is Transmitted by Lice: Reminiscences from My Years at the Pasteur Institute in Paris. 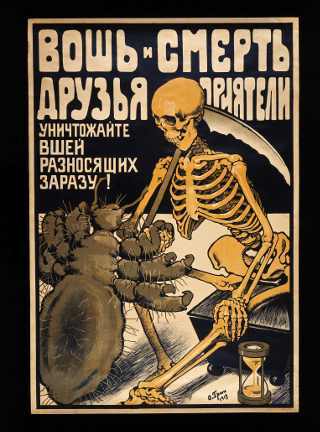 Image of Russian health warning courtesy of Wellcome Images under the Creative Commons Attribution 4.0 International license.